Specific Details: This Buddha statue is sculpted from a dense Javan river stone. The artists' finishing touch was to apply a multilayer stain finish leaving the statue with a magnificent, smokey, dark patina. This is an Indonesian masterpiece sculpture, meticulously carved by hand from a single, solid piece of rock using a chisel and mallet. This statue will make a beautiful centerpiece in any location. The proportions and detail of this hand carved statue are unique, accurate and clean. This piece of art is of temple quality and, when properly cared for, can last hundreds if not thousands of years. 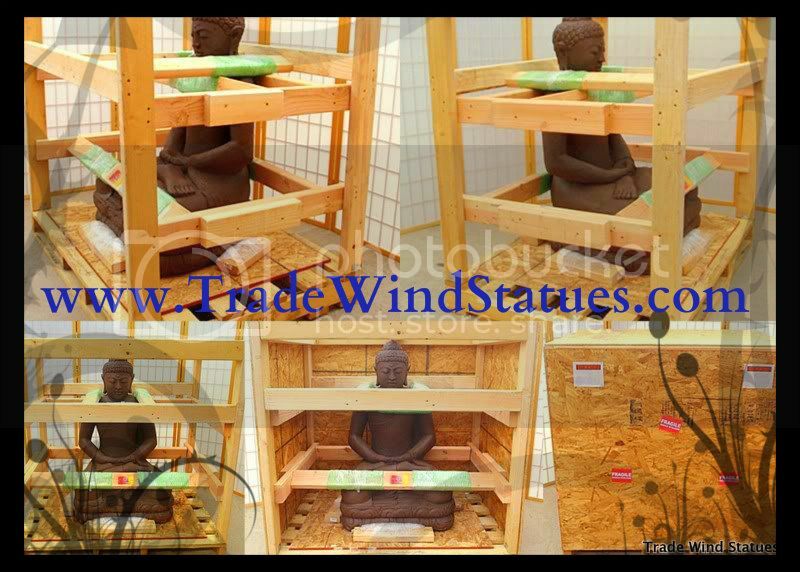 We purchased a similar statue from Trade Wind Statues a few years ago and were amazed at how large the statue was when we received it. Not only that, but the quality of craftsmanship is spectacular! I had to comment on this statue as I cannot believe the price! I have seen smaller stone Buddhas in the galleries here in CA going for 5 times this price. This is a great value!